These baby pavlovas (or ‘little meringues’ as I like to call them) are a family favourite in my household. I must have made the larger versions of these at least five times over the Christmas season. They were featured at every holiday lunch and dinner, and I still have a few left over in the fridge (not that Mike is complaining). This recipe is an absolute breeze if you have a stand mixer. The time is all in the cooking and cooling. The great thing about meringues is that you can make them a day or two before serving and store them away in an airtight container in the pantry (not in the fridge) until you are ready to assemble and serve. You could also make this recipe into one large meringue instead of the smaller versions I have created. The same cooking time applies. If you prefer a more ‘pure’ original pav recipe, feel free to leave off the passionfruit curd. I just love the passionfruit flavour and also the added look of the topping. The curd ingredients also call for the egg yolks not used in the pav, so no wasted egg yolks here. Winning! In the ingredients, you’ll notice I have used a raw castor sugar (I also like to use organic), which is just a finer raw sugar that can be found in your supermarket along with the other sugars. I like to use the raw option as it adds a lovely light caramel flavour to the meringues and is also a little less processed than regular white castor sugar. For the toppings, feel free to use any fruit you have in season. You could create a tropical version with fresh mango, lime zest and lychees, or vanilla marinated strawberries with orange zest. Also, this recipe doesn’t strictly need to be a summer dessert, poached stone fruit, spiced pears or rhubarb would also be delicious. You could even add a teaspoon of cinnamon to the meringue mixture for a beautifully spiced meringue to go with the poached fruits. Yum! Pre-heat your oven to 150 degrees celsius (302 fahrenheit). In a large mixing bowl whip the egg whites until stiff (I use a stand mixer), then slowly add the sugar 1 tablespoon at a time, beating well between each tablespoon. Mix the egg whites and sugar for a further 5 minutes until thick and glossy. Add in the vanilla and vinegar, scrape down the sides of the bowl and beat for a further 5 minutes, or until the sugar has completely dissolved and the mixture is thick and glossy. Scoop the meringue mixture onto paper-lined baking trays, creating a little well in the centre of each with the back of a spoon. This will help to hold the fillings in place when assembling. Place the trays into the oven and turn the oven down to 120 degrees celsius (250 fahrenheit). Cook the meringues for 1 hour and 45 minutes. Once cooked, turn the oven off and leave the meringues in the oven to cool. Place the egg yolks, sugar, lemon zest and juice, and passionfruit pulp into a medium saucepan and stir over medium heat until the sugar is dissolved. Stir through the butter and then simmer while stirring for a further 5-10 minutes. To make the vanilla mascarpone cream, whip the cream, sugar and vanilla together until lightly whipped or soft peaks form. Fold through the mascarpone and set aside. 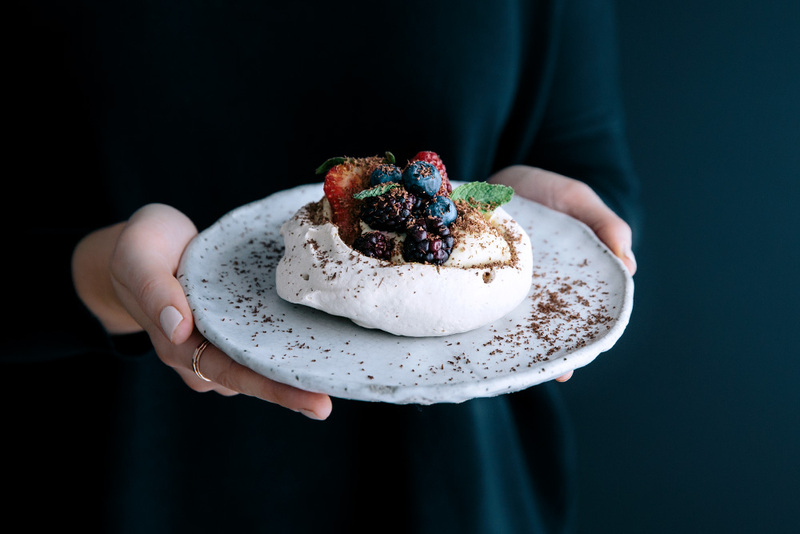 Once the meringues have cooled, top with a dollop of vanilla mascarpone cream, fresh berries, a spoonful of passionfruit curd, some fresh mint leaves and freshly grated dark chocolate. Enjoy! A few months ago I had the privilege of co-hosting an Autumn Food Styling and Photography Retreat.